American-style football continues to grow in Israel, and the Israel Football League has turned to an Alabama coach to keep the momentum going. 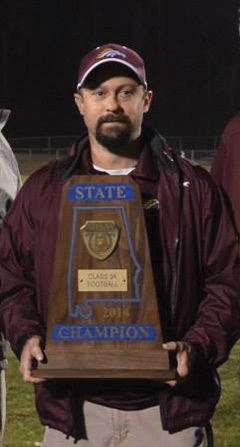 Eric Cohu, who led Madison Academy in Huntsville to three consecutive Class 3A high school state championships, has been named offensive coordinator and international ambassador for the IFL’s national team, which will compete in the International Federation of American Football. Cohu also is national director of Friends of the IFL, which raises funds in America to support the Israeli league. This summer, he will work with the national team as they prepare for two games in Italy. The first will be against Italy on Sept. 2, and then against either Switzerland or Serbia on Sept. 4. The games will be played at Lignano Sabbiadoro. The winner will advance to the European Championship 2017 qualifying round. The team played its first official game in the International Federation of American Football Europe in Madrid on August 30, winning 28-20 and qualifying for this year’s games in Italy. The national team is an all-star team from the IFL. While in the U.S., Cohu will work “to develop strategic partnerships to help develop the league through coaching conduits, colleges, NFL teams and businesses to help develop the league with the resources here in the United States where football is prominent.” He and his family will continue to live in Huntsville. Cohu attended Harding University in Arkansas, then became head coach at Jackson Academy in Tennessee from 2002 to 2005. After amassing a record of 38-12, he became assistant coach at Liberty Christian Academy in Lynchburg, Va., for two seasons before arriving at Madison. At first, Cohu assumed that the person was talking about soccer and was going to tell him it was the wrong type of football, but the person was talking about the initial phases of American football in Israel. The league began in 2005 with a group of Israelis who wanted to play the sport. They played without pads or an organizational structure. In 2007, Cohu started consulting for the IFL during its inaugural season, which saw four teams competing eight-on-eight. Some of his assistance was Internet-based, watching film for them and offer a critique. He also ran clinics and camps for the league each summer when he had time off from his jobs in the U.S.
One of the Israeli coaches, Ori Shterenbach, lived with his family in Alabama for a year, studying American football operations. The league is sponsored by Robert Kraft, owner of the New England Patriots. The Kraft Family Stadium is the only football stadium in Israel; other teams play in soccer stadiums when available. There are eight teams competing this season, which runs from November to March. Israel Bowl IX will be on April 14. There are also dozens of youth and club teams throughout the country. Cohu considers American football to be “the greatest game on Earth,” and is excited by the sport’s expansion into places like India, Dubai and China — and of course, Israel. To help raise awareness, last March, Cohu went to the national AIPAC Policy Conference and helped the league make a presentation. He wants to enlist “anyone that loves Israel, that loves football, who can help in any way, shape or form,” whether Jewish or non-Jewish. Could there be a future where Alabama fans in Birmingham and LSU fans in New Orleans come together to root for a Rosh Ha’Ayin team?